From the observation deck of the Canopy Tower, you may be fortunate to see one of the most stunning butterflies of the Neotropics, the Regal Hairstreak. This flashy member of the family Lycaenidae is distinguished by its iridescent green and blue coloration. The dorsal side (upperside) is a brilliant blue with a thin black border on males, less blue on females. Both sexes have a protruding red spot at the end of the hindwing on the upperside where the long tails trail off. The ventral side (underside) is iridescent green with a thin vertical black stripe and a wide vertical red stripe on its hindwings. Males are marginally smaller than females, and have a brilliant white abdomen. Like most hairstreaks, the Regal Hairstreak has long, wispy tails that appear like a false head and antennae to distract predators away from its head. Larvae are plump and globular in shape, with a cinched “waist.” The caterpillar is green with brown markings in the first few instars, changing to brown and black tones in the later instars, where it reaches a size of 19 mm. Its head is concealed under its globular body. The caterpillar has very good camouflage, and blends in nicely with dried leaves or small branches. The pupa is round, brown and formed on a branch or leaf, and is 15 mm in length. The pupa stage is 14-18 days. Regal Hairstreaks reproduce from June to December, during Panama’s green season. The Regal Hairstreak’s larval foodplant is Manilkara chicle (family Sapotaceae) in Central America. Adult butterflies around the Canopy Tower are seen perching on Guacimo Colorado (Leuhea seemannii) and Harino (Enterolobium schomburgkii) trees; they are often seen flying for brief moments, flashing their blue uppersides, then resting on leaves for often extended periods of time. 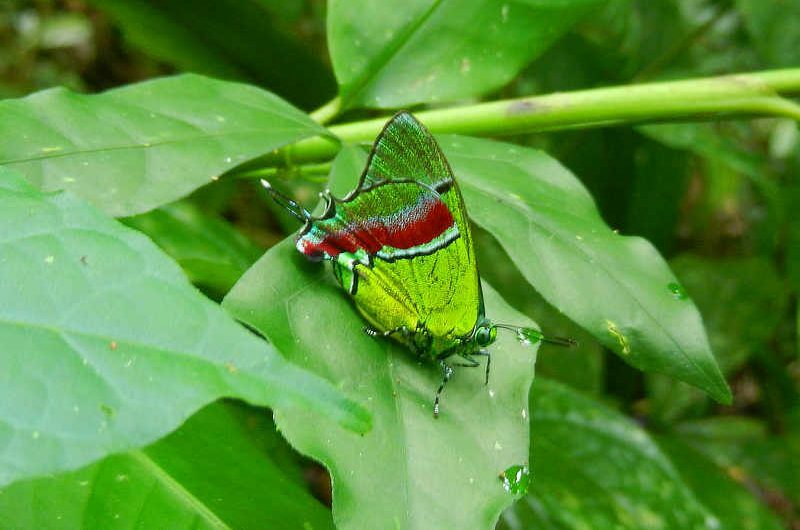 The Regal Hairstreak is found in lowland tropical forests to 1000 meters, and lives in the canopy of the forest. It is found from southeastern Mexico through the Amazon basin. In Panama, it can be best seen around the Canopy Tower.